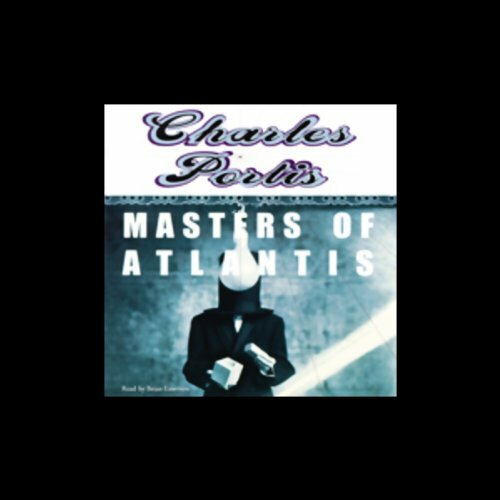 From acclaimed novelist Charles Portis comes this comic masterpiece of secret societies, lost cities, and American dreamers. Stationed in France in 1917, Lamar Jimmerson comes across a little book crammed with Atlantean puzzles, Egyptian riddles, and extended alchemical metaphors. It's the Codex Pappus - the sacred Gnomon text. Soon he is basking in the lore of lost Atlantis, convinced that his mission on earth is to extend the ranks of this noble brotherhood. He forms the Gnomon Society, an international fraternal order dedicated to preserving that lost city's arcane wisdom. From the publication of Jimmerson's own Gnomic texts, through the schism that rocks the Gnomic community, to the fateful gathering of the Gnomons in a mobile-home park in East Texas, Masters of Atlantis is a cockeyed journey into an America of misfits and con-men, oddballs, and innocents. ©1985 Charles Portis (P)2002 Blackstone Audio, Inc. I think this droll novel is a gem, a comic masterpiece, and it's brought me more pleasure than any work of fiction I've read in recent years. The special skill of Charles Portis is an ability to spin a preposterous tale with a straight face, and this time he maintains the gambit for the length of an entire novel. It is the story of Lamar Jimmerson, who while serving in France in 1917 comes across a little book purporting to contain the secrets of the lost city of Atlantis. In no time at all, he is convinced by the tract full of puzzles and alchemy that his destiny is to lead the Gnomon Society. It is a secret circle of earnest good intentions which, among many other things, offers a plan for the US to win World War II with the use of compressed air. The collection of grifters and oddballs is another creation of rollicking, pure absurdity from Portis, in the manner of “The Dog of the South” and “Norwood,” all told as if it were perfectly logical. This is both its strength and its weakness. While “Atlantis” is the equal of the previous two in its delightful peculiarity, it probably goes on a little too long—as if only to prove it can be done. And while narrator Brian Emerson brings a sparkle to the yarn, I missed the deadpan drawl of David Aaron Baker that was such a highlight of the other two books. Portis does have a way with description. The blurb on the cover (from Entertainment Weekly!) says "a glimpse of how a 20th-century Mark Twain might write" and that's exactly right. Absurd details about and around its outlandish characters make it funny throughout. Storywise, it's aimless and just peters out at the end. But if you want a good laugh, it's definitely for you. Brian Emerson doe a great job conveying the prose's tone. I'm finding that when I listen to books I have already read and liked, I get a lot more out of them. I love all Portis' books. Listening while driving can be dangerous though. I laughed so hard at times I couldn't see straight.